A mainstay of Crosstown Rebels with a recent outing on DGTL, Dutch artist Satori brings an eclectic, unique take on electronic music that has perhaps even more to do with organic instrumentation than it does synthetic sound. Continually rising as a producer, performer and multi-culturist, he now proudly reveals his new Thursday night Maktub residency at Ibiza’s Heart nightclub, famous for its creative partnership between Cirque du Soleil and the Adrià brothers that seeks to explore what happens when food, music and art collide. ‘Maktub’ roughly translates to ‘it was written’ in Arabic, used to denote something that was destined to be. Serving as the ethos and creative concept behind the party, it will inform all aspects of the events, from the visual to the aural. 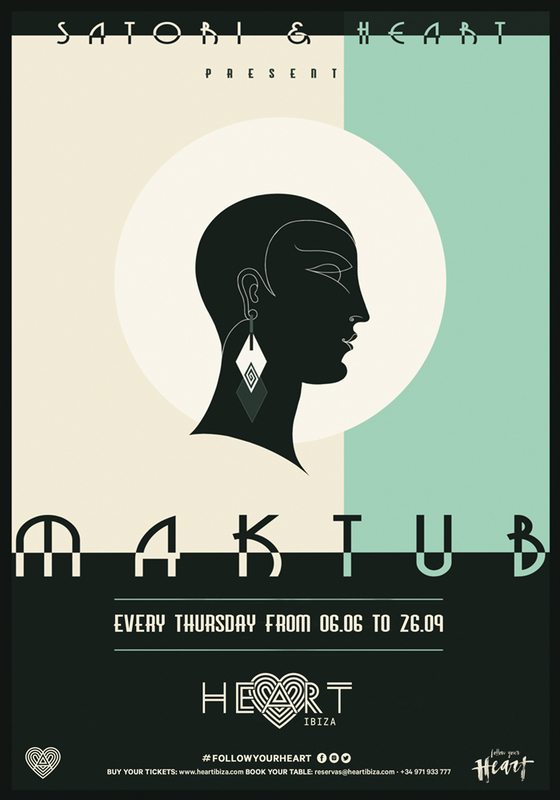 Stepping away from the traditional DJ culture that has characterized Ibiza in recent decades, Maktub will focus on live artists and captivating performers, fusing electronic music with live performance and with a big focus on cinematic, engrossing, thematic visuals. “The idea is to create a further cinematographic experience, where the visual art will perfectly mix with the sound” says Satori, “producing this way what an extraordinary atmosphere should be”. Heart is an intimate, high-ceilinged club venue located on Ibiza Town harbor which is steeped in decades of clubbing history. It makes the perfect canvas for Satori’s widescreen vision of what an event could and should be, and it’s going to be the host for many incredible nights this summer.